On Monday afternoon, Jason and I met the construction manager, Clair, to walk through the house and have him go over our electric/cable drop placements along with looking all of our other options over. It was FRIGID as you'd expect. We joked that someone had forgotten to turn the heat on and that I'd left the door open. Clair showed us, in great detail, the plumbing and electric as well as explaining certain things we never would have had a clue about in terms of new building code and safety precautions. He was quite knowledgeable and it really is amazing all the things they do now to make homes more energy efficient. The differences from 10 years ago even are quite remarkable. The house itself, though, didn't look much different except for wires in the walls and socket rough ins. I know how happy Jason is to see all those ceiling fan rough-ins we paid for this time. That will make his life a little easier when we move in although we won't need ceiling fans right away. The plumbing had passed inspection that morning and the HVAC and electrical were being finished up that day. The only unknown and problem at this point is the sprinkler inspection. Maryland fire code changed in 2012 to require all new construction to have sprinklers (which I'm fine with) but because of that the local fire marshal has to inspect each home. Apparently, Baltimore County wasn't ready for this uptick in requests AND the particular fire marshal for our area is a bit difficult to schedule. Clair said that when you call for a electric or plumbing inspection they come the next day. With the fire marshal, she held them up NINE DAYS for the three houses that are just ahead of ours. GAH! We also asked Clair what his estimate was on completion and he said that we are on the verge of drywall (waiting for sprinkler inspection) and once it's up, he says about 6 weeks. Our sales agent, Matt, said that Clair is generally conservative on his dates so we are hoping that means that the end of March should be it. Once the drywall is up too, they will give us the settlement date AND we can lock in our interest rate. I'm fine with the end of March but it does figure that if we settle that last week that the following week is spring break which means the kids will be around. Of all the weeks I'd want them to be in school! 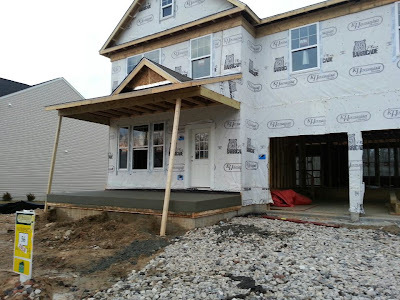 Oh well, we'll be so happy that the house is done, maybe we won't care. Or maybe we'll just make them stay down in the new basement. Yesterday (Tuesday), was fun because Matt posted on FB that our porch was being poured and the HVAC checked. 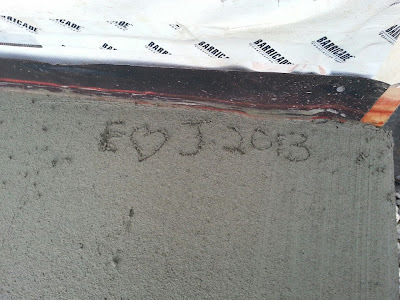 And then later in the day one of our new neighbors sent us a message to say that the porch had just been poured and to get over there if we wanted to mark it. Jason told me to go ahead and I have to admit I was very nervous when I got there that I was going to mess it up. But, I found a nail and gave it a try. 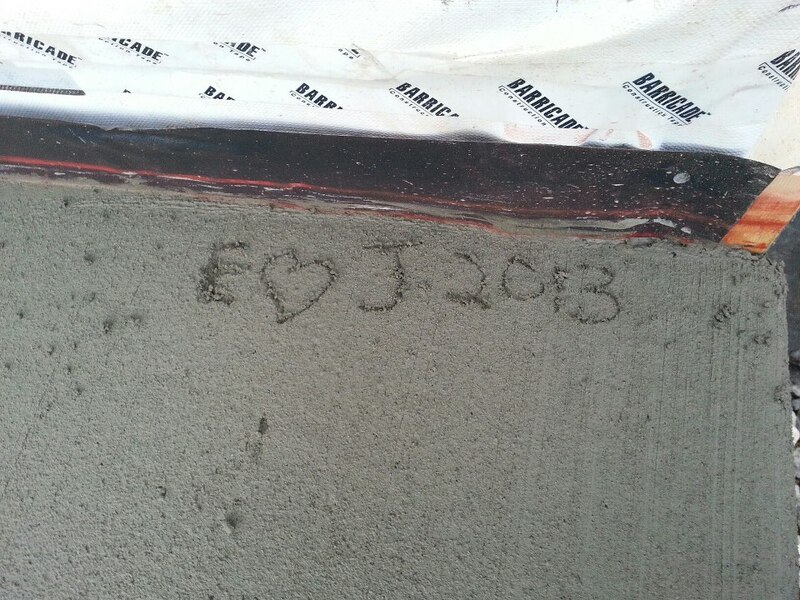 The "E" came out a little messy because I was getting a feel for the cement but the rest came out nicely. I did it in the upper right corner (facing the house) right by the garage. People asked if we were going to do something for the kids and I figure maybe when they pour the driveway but to me, it was more important for Jason and I. This is OUR house. I feel like my heart is already there and I cannot wait to live there. I cannot wait for our lives to start there. Not that the old house wasn't loved and wasn't ours, but I just feel differently about this house for some reason. Maybe because I always knew we wouldn't be in the old house for the long run. So now we are hoping that the rest of the porch can be assembled soon (love those Arts and Crafts pillars) along with the siding. And with any luck that fire marshal will be out soon and the drywall can begin!